At the check in counter of the Penang International Airport, I watched four years of my life, packed in suitcases, roll away on the conveyor belts into the mass hysteria of baggage hidden behind the wall. I had graduated from high school three days before, and now I was leaving Malaysia. While standing in line for immigration, clutching my boarding pass and tattered passport, I glanced behind me for a final wave at my friend who had dropped me off. I didn’t know when I would see him again, if ever. I tried to stop the flood of apprehension that swept over me by looking down at the floor. What is it about airports and ugly carpets? Security was a breeze. I absentmindedly pulled out my computer and cell phone and put them in separate plastic containers. Then casually tossed my backpack on the X-Ray belt and emptied my pockets. It took me all of 10 seconds. I tried to not tap my foot or sigh in impatience as the man in front of me struggled to get himself organized. Sometimes it’s easy to forget that going through security isn’t routine for everyone. I like to sit by the windows at the gate, to see the plane that’s going to take me on my next adventure. And I like sitting by the windows on a plane, so I can get one final look at the place I’m leaving. I’m 20 now, and I’ve lived overseas for 15 of those years. I’ve lived in five different countries, and lost count of how many times I moved. As a TCK, it’s hard to find anything that’s “constant” in life. Usually the constants aren’t fun – people constantly coming and going, constantly having to settle into a new routine, constantly learning a new language. It’s tiresome. 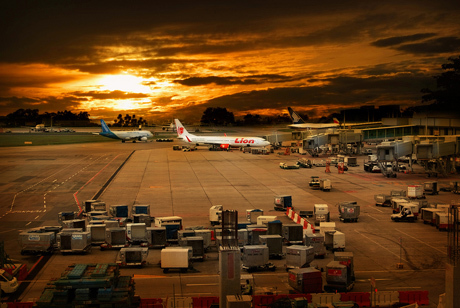 Throughout it all, airports have been constant for me. I’ve been on so many planes that I can recite, word for word, the safety presentation on about eight airlines in three languages. I don’t say that to brag. If anything, it means that I’ve been on the move far too long. Not that I’m complaining, but in the chaotic series of events that is my life, airports and their routines are the only thing I can really rely on to be somewhat predictable. Unlike language, social custom, food, which side of the road to drive on and weather, airports are consistent throughout the world. The Changi Airport in Singapore is by far my favorite one. Where else are you going to find an airport that has a 24-hour movie theater? Or a sunflower garden? Or museums? Often, I wish I had a longer layover there. I’ve never lived somewhere longer than four years, but I’ve been going through Changi Airport for over 15 years. That’s got to count for something. I spend a lot of time on the moving walkways observing the things going on around me. There goes a family running toward their next gate. People look funny when they run with backpacks on. Even though I can feel the tension of transition in the air, I’m relaxed. I think about where I’ve been, and where I’m going. This time, I’m on my way to the U.S. I instantly feel a pang in my gut. I’ve usually disliked the month I spend there every summer. I hate the culture shock. I hate the feeling of foreignness. Wait. Do I feel like I fit in more in an Asian country? I look at myself in the reflection of the glass window in front of me. Yup, tall, white, curvy and long red hair. I totally blend in Asia. I wish my reflection showed what color my heart looked like. I wouldn’t call it meditating, but I definitely seem to do my most deep reflecting in airports. When everyone around me in stressed and scrambling to make their connection, or excited because they’re going to a new exotic place, I am calm. Maybe airports aren’t my home away from home. Maybe they are my home. LOVED this post. Heartfelt and very moving. I just spent some time with Ruth Van Reken (co-authored Third Culture Kids), driving her around to presentations here in The Hague Netherlands, and her words mingle so beautifully with yours. I’m starting a new project in the next 3 weeks that I think you’d like to contribute to, so I’ll catch you over at your website. I really like your article – airports feel the most like home to me too although I’m trying to find a permanent “home” place that I can be happy with. I think if you can use your TCK skills in your daily work to help others then you’ll feel at home no matter where you are. Colorado’s a great place – I hope you truly come to love it! Beautiful post!! Totally relate to the security line toe tapping, and I agree, Changi is an AWESOME airport. My EdD thesis is on international transitions and early childhood students and found this is one of the main challenges for internationally mobile people. Good luck.